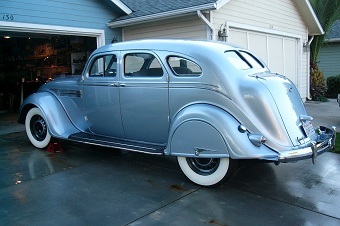 Airflows were the first Streamlined Production Cars in the World, produced in 1934, 1935, 1936 and 1937. 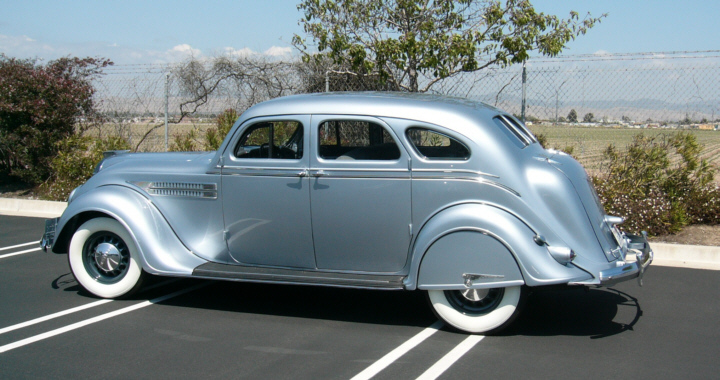 Born at the start of the Art Deco Streamlined movement in auto design, the Airflow broke new ground, pioneering the movement; the first mass produced car with aerodynamic science behind it's design engineering. A technically advanced car, it's features still compare well with cars built over the next 30 years. It's body is like a fuselage, aerodynamic, with subtle contours. The doors are compound curves, its lines fluid. Window area is rather small compared to the sheet metal. It's like a cocoon, designed for passenger safety. Mine is a Model C9, with the original 323 straight 8 engine. It rolled off the assembly line March 6, 1936, and was delivered to EA Boyd Company of Sacramento, CA, and spent its life in the rural areas around San Francisco, Sacramento and Woodland. C9s were only produced in 1936 and only 1,450 were made. Of these, 94 were two door coupes and 1,356 were four door sedans. So mine is one of 1,356 produced. It appears (based on Airflow Club roster numbers) about 40 C9s are known to still exist. This does not include three or four more in junkyards worldwide that will never run again.